When dealing with gases and the gas laws, you will need to solve for, or plug into an equation, values for many different quantities. Paying attention to units is important. When dealing with volume, it is good practice to make sure your values are always in liters (L). Although you can sometimes get away with milliliters (mL), there are some situations where this is not the case. Therefore it is recommended that liters always be used. Temperatures must be converted to kelvin. The mathematical signficance of this is twofold and is related to the proportions often used to solve problems. First, the temperature variable is in the denominator of certain problem solving processes, meaning that plugging in a value of 0°C would imply that you are dividing by zero. Secondly, if you using a proportion and plug in a negative Celsius temperature into one ratio and a positive temperature into the other, you will end up with a negative propotion equalling a positive proportion. To eliminate the mathematical impossibilities, always use absolute (kelvin) temperature. Boyle's Law is an expression of the relationship between the pressure and volume of a fixed quantity of gas. It was initially described by Robert Boyle in the 17th century. Find the pressure on 5.25 L of gas that was originally 3.12 L at 1.54 atm. A 5.0 L vessel of gas is held at 25°C. What will be the new volume if the temperature is doubled? 25.0 L of a gas is held in a fixed container at 1.25 atm at 20°C. 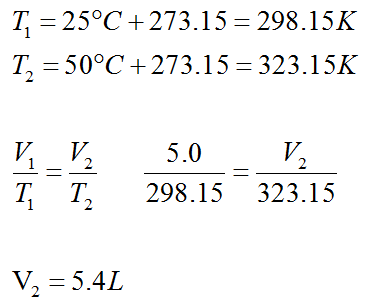 What will be the pressure of the gas if the temperature is increased to 35°C? Next, the appropriate subsitutions can be made into the equation. Note that the volume given in the problem is immaterial to the solution. The phrase "fixed volume" communicates that volume is constant in this problem, and thus any equation that uses "V" is not to be used. The combined gas law integrates Boyle, Charles, and Gay-Lussac's laws. Here, the only constant is the number of moles of gas. Notice that if you cover on set of variables, either Charles, Boyle, or Gay-Lussac's Law remains. For example, if you cover T1 and T2, the remaining equation is the same as Boyle's Law. Removing P1 and P2 leaves Charles's Law and eliminating V1 and V2 leaves Gay-Lussac's Law. The ideal gas law is used to approximate the behavior of a gas at conditions given by the pressure, temperature, and volume variables. 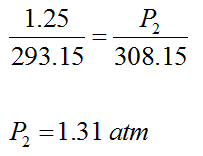 Typically, the approximation is reasonable for situations close to STP (1 atm pressure/273.15 K), but deviates greatly at extreme pressures and temperatures. Unlike the previously mentioned gas laws, there is no "initial" and "final" or "before/after" context to a problem that uses this law. Generally, this law is utilized for gas stoichiometry problems or situations where most conditions of a gas are known except for one. Let's look at a problem that involves the second scenario. Determine the volume of 45.9 g of neon gas at 78.2°C and 184 kPa pressure. Like the ideal gas law, Dalton's law makes some key assumptions. Namely, the gases must be unreactive and follow ideal gas behavior. The law says that the total pressure of a gas mixture is equal to the sum of the pressures of each individual gas. 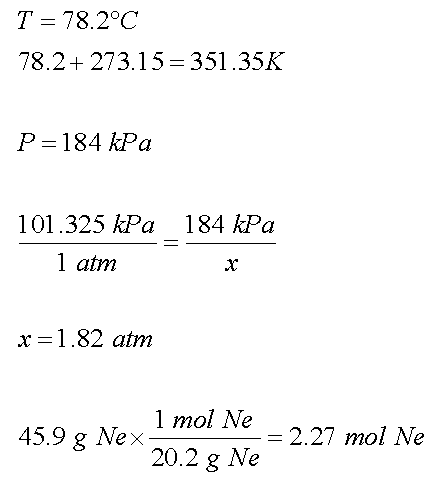 In the derivation below, M represents the molar mass for the particular gas and m represents the mass of the gas sample. Note that unlike Boyle's, Charles's, or Gay-Lussac's Law, the identity of the gas makes a difference when determining density, but ultimately the mass of the sample does not. The initial substitution of n (moles) for m/M reflects how the number of moles of a substance is calculated - from dividing mass by molar mass. Densities of liquids and solids are typicalls expressed in g/mL or g/cm3. However, since a mL of gas would contain a very small amount of mass, the denisty of a gas is generally expressed in g/L. This can be seen as a modification of the ideal gas law, notably with the addition of variables "a" and "b." 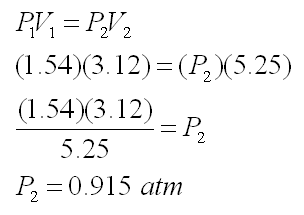 These variables are unique for each gas and provide a calculation that is more representative (but still not always correct) of a gas at the conditions plugged in for pressure, volume, or temperature. When dealing with gases, it is often more important to know the volume of gas that is produced during a reaction than its mass. At STP, 1 mole of any gas will occupy a volume of 22.414 L. This is an important stoichiometric relationship, but it is only useful at STP. 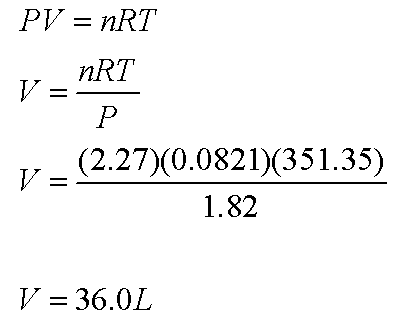 At non-STP conditions, the ideal gas law must be utilized. See the stoichiometry page for more detail.